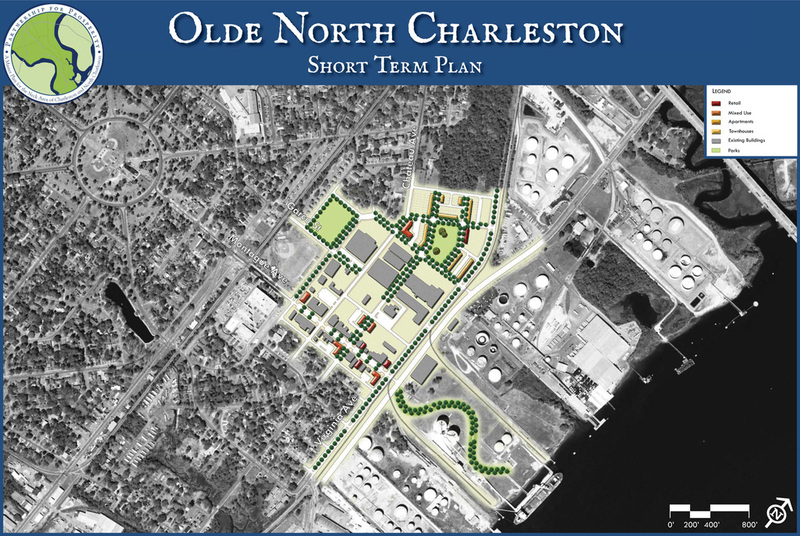 The Olde North Charleston catalyst area is a neighborhood center. In the early 20th Century, this portion of North Charleston was laid out, with Park Circle as the center and separate areas designated for residential, commercial, and industrial uses located along streets radiating from that core green space. The catalyst area, situated between the residential lots around Park Circle and the growing industrial uses along the Cooper River, developed as the business district. Montague Avenue and several blocks to the north, primarily between Jenkins Avenue and Virginia Avenue, still function as a neighborhood commercial core, with residential and civic uses to the north and south. 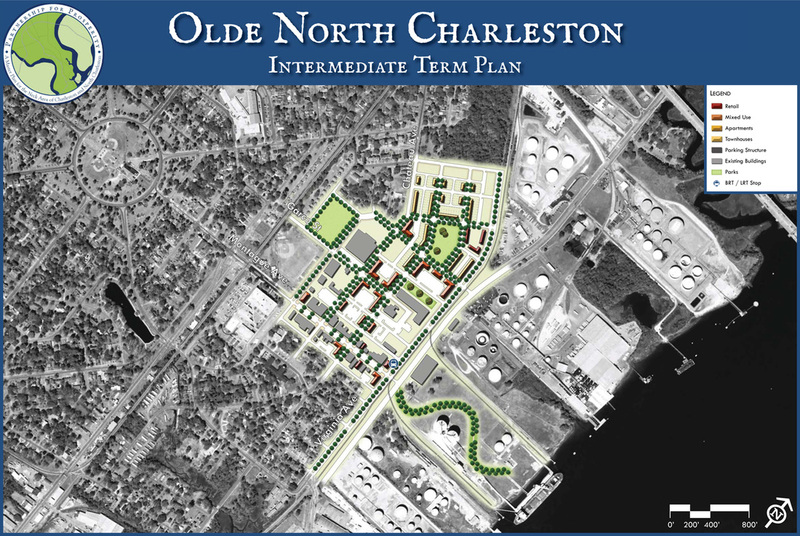 North Charleston High School and accompanying athletic fields, as well as CSX railroad tracks, are located west of Jenkins Avenue and industrial uses are located east of Virginia Avenue along the river. There is a large vacant parcel (Garco Property) on the northern portion of the catalyst area east of Chateau Avenue that backs up to a railroad spur. 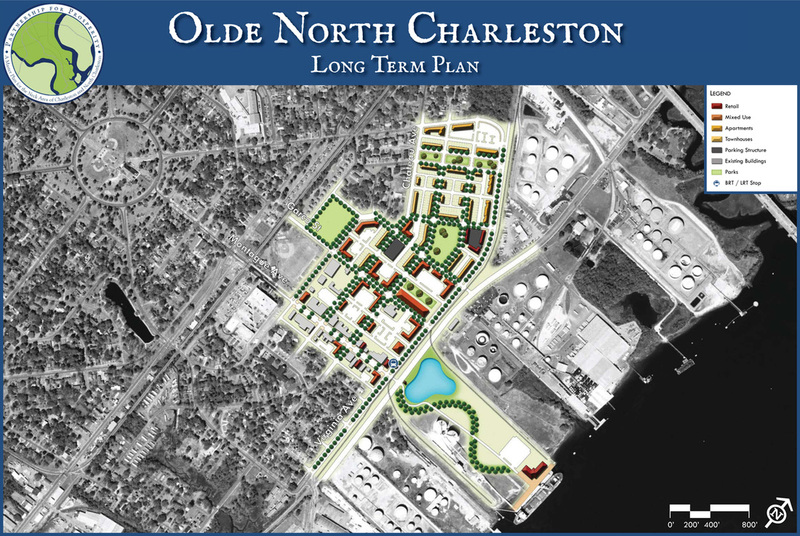 Over the last decade, the revitalization of Olde North Charleston and the Park Circle neighborhood into a desirable destination has become a tremendous success story for the City and an example for the Neck area. That revitalization is a testament to the neighborhood’s authenticity, commitment of residents and City leaders, as well as its regional accessibility and traditional urban form. With that success, it is serving as an impetus for improvements and investment in adjacent neighborhoods, thus strengthening the attraction of the area for residential relocations and new business. The continued transformation may eventually put more pressure on industrial uses along that portion of the Cooper River to ready the sites for a change to residential or mixed use development. It will also provide more impetus on making Montague Avenue a stronger gateway corridor from I-26 into Park Circle, thus benefitting the Liberty Hill neighborhood and making the roadway safer for pedestrians and bicyclists. Even though this is an established area with a long and rich history, there are still catalyst opportunities along Montague Avenue that can spur new growth along this main street corridor. There are several vacant parcels that can be developed with a mix of workplace, neighborhood commercial or residential uses that can effectively complete the street face. This new development, along with other underutilized buildings, can introduce vertical mixed uses to expand housing choices and provide needed goods and services. Building sizes in this catalyst area are envisioned to be low-rise (1-3 stories) to match the existing building heights and street face or complement the neighborhood scale. Multimodal accessibility continues to be provided through local bus service, but access by other modes is enhanced by the addition of a planned multi-use trail for pedestrians and bicyclists alongside a reconfigured Virginia Avenue, as well as new sidewalks and bike lanes or sharrows. This roadway is an important “through route” for freight movement, but also will be designed to accommodate non-auto travel in a separated right of way. The preliminary planning level program derived from the Long Term Phasing Concept Plan shows that about 250 residential dwelling units and 700,000 square feet of non-residential uses could be developed in this catalyst area.